Replace your desk or floor lamps light bulbs far less often with this long lasting natural sunlight bulb. This energy saving replacement light bulb by Lavish Home is designed to keep you from making countless trips to the hardware store while keeping your energy bill low every month. Giving off natural light, your eyes will be under less stress, decrease depression, and make it easier to see. IMPORTANT: Avoid buying counterfeit products and transacting with unauthorized sellers. Look for our logo on the packaging for every one of our products. Lavish Home is committed to providing the consumer with the absolute best price and value on all our products, which we ensure by applying a rigorous Quality Control process. Lavish Home. is a registered trademark protected by U.S. Trademark law and will be vigorously defended. APPROXIMATES NATURAL LIGHT- This therapy light bulb provides pure, bright, and natural light, making it easier to see while eliminating eye stress and fatigue. 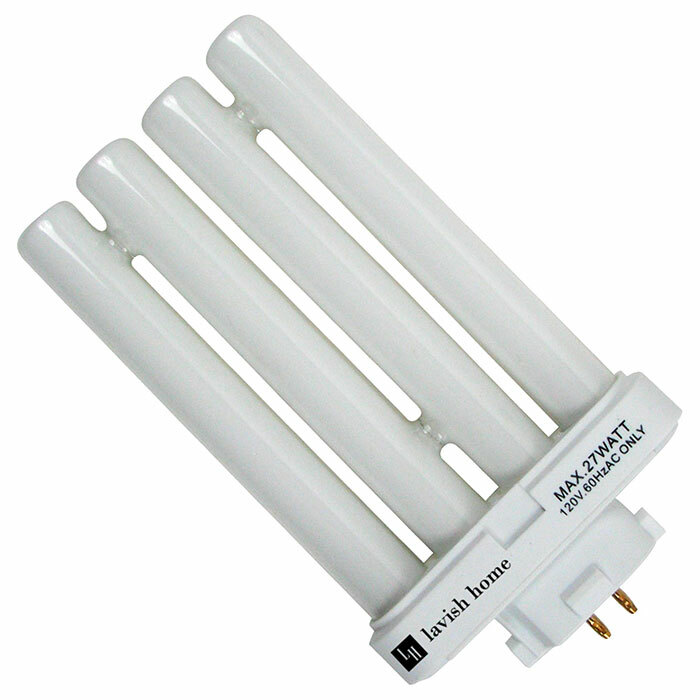 This energy-saving replacement bulb gives off 27 watts and 1300L making it equivalent to daylight and natural sun. GREAT REPLACEMENT LIGHT- Did your floor or desk lamp light just burn out? Get back to reading and sewing under your Lavish Home floor or desk lamps with the perfect replacement light bulb. ENERGY SAVING- The days of having to pay outrageous energy bills are over. The multi socket light bulb will not only save you money on your energy bill, but also reduce the amount of times you’ll need to replace your light bulbs. PRODUCT DESCRIPTION- 5” (L) x 2.7” (W). Wattage: 27W. SATISFACTION GUARANTEED- Lavish Home is committed to providing consumers with the absolute best price and value on our entire line of products. NOTE: This is an exclusive product of Everyday Home and ONLY Lamp Light Bulb Replacement by Lavish Home are GUARANTEED to be genuine.